Rolls-Royce was once the darling of the aerospace sector. But heavy financial losses and a corruption scandal present challenges for the new CEO, and sheds light on risks and behaviour in the defence industry. Rolls-Royce, it is said, is essentially a hedge fund with an aero engine-maker attached. The past few months, however, show where the company’s risks really lie. First came January’s announcement that the company is to pay £671m to settle corruption cases with UK and US authorities spanning nearly 25 years. Then in February, it emerged that the financial thorns and bushes that the 113-year-old aerospace business carefully tends ended up scarred, in a £4.4bn write-off in the aftermath of sterling’s fall following last summer’s Brexit referendum. The result was a pre-tax loss of £4.6bn for 2016 by the company that is supposed to house Britain’s engineering crown jewels. So what exactly went wrong at Rolls? Can it recover and what does it teach us about how defence companies need to behave to control the unique risks of the sector? Rolls is no stranger to crashing losses. Founded in 1906 by Charles Stewart Rolls and Frederick Henry Royce in the early-20th-century automobile manufacturing boom, the company moved into making piston aero engines during World War I and then later, during World War II, took part in the development of the jet engine. More than 175 industrial customers were operating Rolls-Royce gas turbines for power generation, gas and oil pumping and other industrial purposes. Yet it was crippled in the 1960s by mismanagement of its advanced RB211 jet engine and cost overruns, leading to the financial collapse of Rolls-Royce Limited in 1971. Deemed too big to fail, its assets were taken over by Britain’s Labour government, with the insolvent corporate entity put into liquidation. The aero-engine business was separated from the luxury carmaker but remained state-owned until 1987, when it was sold to the public in a stock market flotation. Rolls proved a good investment. According to the prospectus for the share sale, it was, at the time, one of only three enterprises outside the Soviet Union and China able to design, develop and manufacture large gas turbine engines. Its engines were installed in the aeroplanes of more than 270 civil carriers, 110 armed services, 700 operators of executive and corporate aircraft, while the turbines produced by its marine division were powering the naval vessels of 25 nations. More than 175 industrial customers were operating Rolls-Royce gas turbines for power generation, gas and oil pumping and other industrial purposes. The company had successfully globalised under its state ownership. In the five years to 1987, exports grew to 70% of its sales. In the year of the flotation, a marketing survey ranked the Rolls-Royce brand second only to Coca-Cola in terms of its global recognition. Rolls remains a global force, ranking second only in the aero-engine market share to America’s General Electric (GE), and remains one of the world’s top 20 defence contractors. Last year’s loss was, therefore, an historic blow, even though it was widely expected by the City. The corruption scandal, after all, has been well documented. An investigation by the UK’s Serious Fraud Office (SFO) resulted in allegations amounting to 12 counts of conspiracy to corrupt or failure to prevent bribery in Indonesia, Thailand, India, Russia, Nigeria, China and Malaysia between 1989 and 2013. There were also allegations by the US Justice Department and Brazilian regulators. Rolls was found to have made payments covering contracts that earned the company more than £250m in gross profit. Rolls’ new management, led by former ARM Holdings chief executive Warren East, apologised “unreservedly” for the cases, which typically involved payments and inducements allegedly given to local intermediaries. In Indonesia, senior Rolls-Royce employees were said to have agreed to pay such a middleman $2.2m and a Rolls-Royce Silver Spirit car in return for “showing favour” to the company, in a contract for its Trent 700 engines. In China, Rolls-Royce staff allegedly agreed to pay $5m to CES, a state-owned Chinese airline, while negotiating the sale of T700 engines. The SFO said some of the money was intended to pay for CES employees to attend a two-week course in America and enjoy “four-star accommodation and lavish extracurricular activities”. In Thailand, Rolls-Royce agreed to pay $18.8m to regional intermediaries in respect of an order by Thai Airways. And in India, the company used an intermediary at a time when that was restricted by the nation’s government, claiming that payments made were for “general consultancy services” rather than sales commission. Some 38 Rolls-Royce employees faced disciplinary proceedings stemming from the scandal. Eleven left the company during the process, and six were dismissed. Rolls also reviewed 250 intermediary relationships and suspended 88 such middlemen. It says it has undergone a “fundamental change”, with systems overhauled, training given and governance and ethics strategies implemented. Investigations continue into executives, including former chief executives Sir John Rose and John Rishton, who led Rolls-Royce during the years covered by the allegations, though no charges against any individuals have been brought. The currency-related losses, meanwhile, were a result of the unexpected fall in the pound. Rolls conducts most of its contracts in dollars but pays most of its costs in sterling, so its £30bn currency hedging book is designed to cushion it against a fall in the dollar, rather than the pound. It still looks rather a clumsy loss. Yet, analysts took heart from Rolls’ underlying profits of £813m for 2016 which, while nearly half of 2015’s £1.4bn, were better than many had forecast. “In normal times, this eye-watering loss by one of UK Plc’s corporate jewels-in-the-crown would dominate the headlines,” says Kevin Morrell, professor of strategy at Warwick Business School. “But these aren’t normal times and one question to ask is: why hasn’t this been an even bigger story? “Investors may be banking on the threats that caused the loss-lying in the past, and indeed the corruption fines were based on an agreement to avoid prosecution, so they have removed future uncertainty.” He adds: “Though profits were down, they weren’t as bad as first feared, while Rolls-Royce is still a company that UK Plc can be proud of, providing something that no other company in the world can do as well. Professor Morrell credits Rolls’ new management with managing the crisis well, developing a clear story and removing future uncertainty. Yet, there remain many issues with the underlying business. Richard Aboulafia, vice-president of analysis at aerospace and defence market intelligence firm Teal Group, has been warning of troubles at the company since November 2015, when the company announced a $1bn hit to pre-tax profits due to weak demand and high costs, prompting a 20% share price fall. He sees the company’s problems falling into three categories: bad things that happened as a result of factors beyond its control; poor strategic moves and performance problems; and a combination of the two. The first category of “outrageous fortune” includes the cancellation of the F136 Alternate Fighter Engine being developed by Rolls-Royce and GE for the Lockheed Martin F-35 Lightning II aircraft in December 2011, after the Pentagon failed to give further support. Then there was the over-production by Canadian aerospace manufacturer Bombardier of high-end business jets, resulting in overcapacity and a production downturn; the cancellation of Britain’s Nimrod maritime patrol aircraft programme and retirement of the entire UK Harrier fleet; weak UK defence spending; and a serious downturn in procurement for the Bell Boeing V-22 Osprey military aircraft. In addition, Rolls was hit by Airbus’s slow production ramp up for the A350XWB, a production downturn in the Airbus A330 and a wide-body market glut resulting in earlier-than-expected retirements of Rolls-powered Boeing 747-400, 777-200ER and Airbus A340-500/600 planes. Rolls-Royce’s “self-inflicted wounds”, meanwhile, included the 2011 sale of its 32.5% share in International AeroEngines, a Zurich-registered joint venture developing an aircraft engine to address the 150-seat single-aisle aircraft market; and a decision not to join Pratt & Whitney, which bought the stake, in developing a geared turbofan for the single-aisle market. As a result of those two moves, Rolls exited the entire single-aisle jetliner market, the biggest single market in aerospace. Aboulafia also faults the performance on Rolls’ Trent 500 engine and fuel burn issues on the now-discontinued Airbus A340-500/600. He believes Rolls was wrong to devote heavy resources to Airbus’s A380 aircraft and cites its inability to develop a successor to the heavy and out-of-date AE3007 for large business jets and regional jets—a market now dominated by Pratt, GE and French aerospace group Safran. Somewhere in between the two categories, he believes, falls Rolls’ first-time loss of a Gulfstream engine competition, for the G500/600, to Pratt & Whitney; and its loss of the Bombardier Global 7000/8000 contract to GE. Together, these losses ceded the entire fast-growth, ultra-high-end business jet market segment to Rolls’ two key rivals. In addition, the company diverted its focus to energy and marine propulsion markets just as those markets were hit by an oil price downturn and marine overcapacity. “Rolls-Royce is a very good company with a remarkable heritage and a tradition of fine engineering,” says Aboulafia, “but a combination of foolish strategic moves and simple bad luck has put the company in a very difficult position. Turning Rolls-Royce around will be a long-term task in an industry where decisions and investments take a lengthy period to produce benefits. New CEO Warren East has promised a new “vision” of the company’s future, while some analysts believe the group should sell the marine engine operations and other activities to refocus on aerospace. Aboulafia believes Rolls still has a very strong engineering capability and promising new technology proposals, and that it could recover nicely under the right leadership and with co-operative market tailwinds. The scars from the corruption scandal may take longer to heal, however, with regulators in other territories now looking at whether Rolls infringed their rules. Sodhi believes the scandal has to be seen in the context of changes to international bribery laws, with UK legislation falling into line with US anti-corruption laws since 2010, and many other jurisdictions still yet to catch up. Rolls’ settlement may, therefore, mean that it will now be at a competitive disadvantage in markets where irregular payments for contracts are still a way of life. 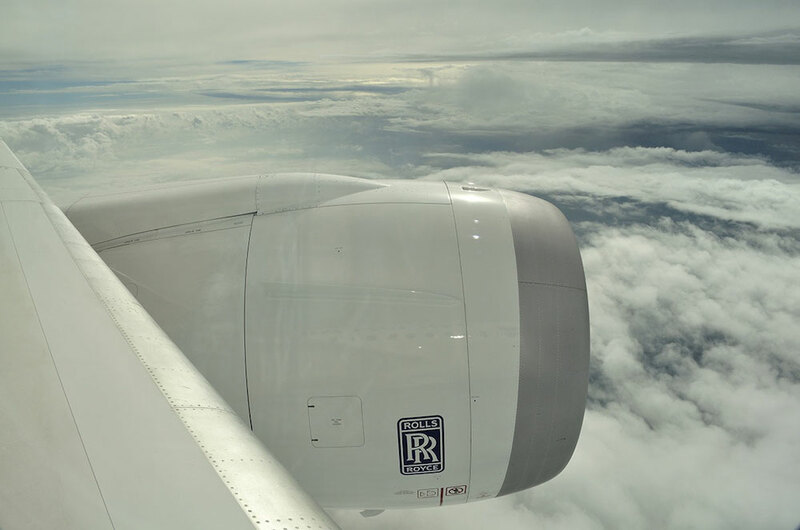 Having made its position clear, Rolls-Royce’s biggest challenge now involves stabilising its business and demonstrating that it is driven by the aerospace and engineering expertise it is famed for. That promises to be the biggest task of East’s career, but it will not be an easy ride. Investors should strap themselves in for more turbulence. February 1971: Rolls-Royce Ltd declares bankruptcy and is taken into state ownership following early problems with the RB211 jet engine and cost overruns during the 1960s. May 1973: Flotation of the motor-car division as a separate entity. April 1987: Rolls-Royce is returned to the private sector, undergoing a number of mergers and acquisitions. 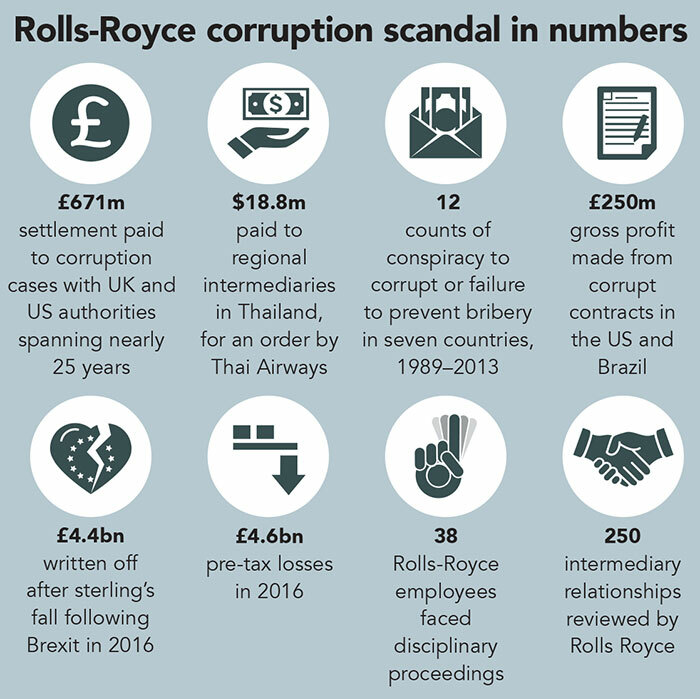 December 2013: Serious Fraud Office opens criminal investigation into allegations of bribery and corruption at Rolls-Royce. January 2017: The SFO and Rolls-Royce enter into a Deferred Prosecution Agreement (DPA), which enables Rolls-Royce to account to a UK court for criminal conduct spanning three decades in seven jurisdictions and involving three business sectors. 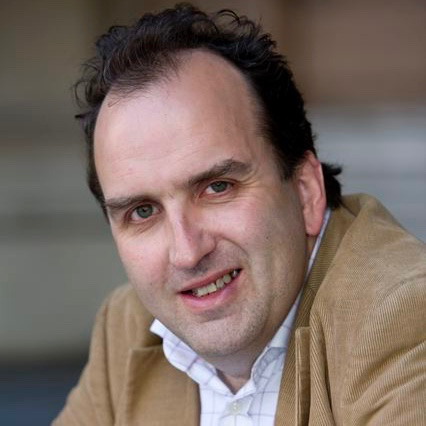 Andrew Cave is an experienced business journalist who has written for The Telegraph and Forbes. Investment manager Legal & General Investment Management increases pressure on companies over climate change by naming those it has disinvested from. US clothing retailer faces claims that performance has suffered because of a lack of boardroom diversity. The 6th Company Secretary Forum, on 23rd November in London, promises greater participation from delegates, and interaction with speakers.